There Is A Deadly Snake On This Tree Hiding Right Before You Eyes. Can You Spot It In Under 30 Seconds? Recently, a deadly rare species of a very poisonous snake has been found on a tree in Maitland north of Sydney. It’s called as Stephen’s Banded Snake. Now you may think like, what’s so big deal about it? 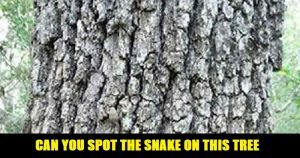 Coming to the point, there may be a hundred types of poisonous snakes in the world but the internet is freaking out over this one in particular because of how perfectly it has camouflaged itself on the bark of a tree. This photo was posted on Facebook by Leanne Cook, the snake’s skin of multiple shades of grey makes it difficult to spot. Okay, now let’s see how long you take to spot the snake. Stephens’ Banded snakes are described by Queensland Museum as “ready biters” with venom that affects blood clotting. Well, here is the deadly snake in the picture. Take a closer look now. So this latest optical illusion to spread around the internet rang a special bell with everyone. Now share it with your friends.